The first club trip of the summer season is an easy and gentle paddle on the Upper Hamble on Sunday 30th April meeting 13:45, on water 14:15 off water by 16:00. This trip is suitable for all boat types and all grades of paddler and is on a sheltered and very scenic stretch of river with good wildlife. We will meet at the Horse and Jockey pub in Curbridge. Come off M27 at junction 7, Botley, drive through Botley village, turn right onto A3051 direction Curbridge and the pub is about 1 mile on the left. Please use the hard stand parking at the back of the main pub car park if possible. The pub is kayaker friendly and does good food for those interested. 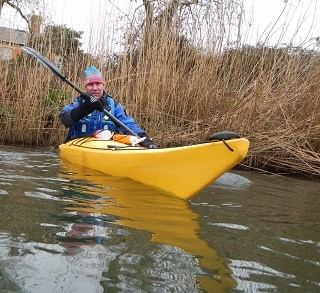 I will be there around 12:45 for lunch and could have my arm twisted for a quick slurp after the paddle. If anyone wishes to use club equipment please let me know before Sat 29th Apr and anyone requiring transport or equipment carrying please let me know in good time and I will try to assist.